When all you want for dinner is some nice warm soup but if you are too lazy to peel and cut vegetables, saute, boil, cool, blend, and boil as for a regular soup, this dal soup is a perfect option for you. It is quick and easy to make, and the light spices help in easy digestion. Wash toor dal well, add water, and pressure cook to 2-3 whistles. Let the pressure release naturally. Take the cooked toor dal out of the pressure cooker, and pass through a sieve or a whip in a blender to make it thick and smooth consistency. Add salt. Keep aside. Heat oil in a pan. Add curry leaves, jeera, slit ginger and green chilies. You can lightly crush the cumin seeds to bring out the flavor. Stir until ginger pieces are sauteed. Add the cooked dal paste and bring to boil. Simmer for a minute or two. Adjust water and salt as required. Turn off. Add lemon juice just before serving. 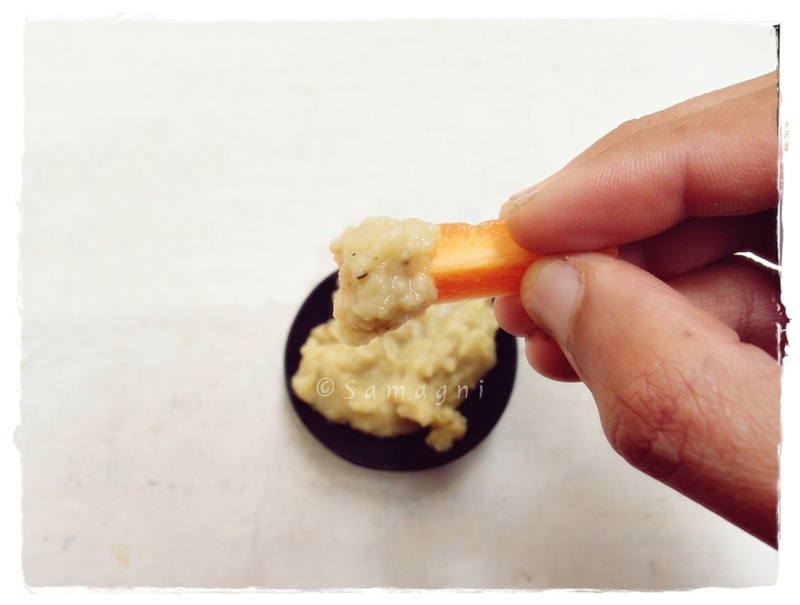 Smoky, garlicky, healthy, and simple – I am totally in love with this dip. Baba Ganouj is a Middle Eastern eggplant dip. The original Greek recipe calls for Greek Yoghurt, which I skipped. Yet the result was amazing. I can only imagine how tasty the original must be! Once you try this recipe, you will never buy a dip from the market. Serve it with breadsticks and vegetables to guests, pack it off along with crackers to the kids for snacks, or just spread them on to your bread toast. It is amazingly delicious. I seriously love this purple vegetable! Wash the eggplant and pat dry. Use a fork and prick the eggplant all over. Place on gas flame and roast it over a low flame. Turn the sides about every 30 seconds so that the eggplant gets cooked all over and completely. Remove from flame when the outer skin is charred and you get the smoky eggplant smell. This would take about 2-3 mins. Alternatively, you can use an oven to do this. But you will get a smoky flavor only if you roast it directly on fire. Wait for the eggplant to cool a bit, and then remove the stem and peel off the outer skin carefully. Chop the eggplant. If you feel that some parts of the eggplant is uncooked, cook the eggplant on a pan along with tablespoon of olive oil for about 3-4 mins. You may avoid this step if the eggplant gets fully roasted over the flame. Allow to cool. In a mixer, grind the eggplant, garlic, salt, pepper, and jeera seeds, together. Add lemon juice and make into a smooth paste. Adjust pepper/salt/garlic as required. Garnish with dil leaves, parsley, or use the Italian pasta/pizza garnish. Drizzle olive oil. Healthy, delicious, and easy eggplant dip is ready to be served with crackers, bread toast, sliced cucumber, carrot, bell pepper slices. Thiruvathira, a festival observed mainly by Keralites and Tamilians, is a women-centic festival celebrated on the day of Thiruvathira star of the Malayalam month of Dhanu masa that mostly coincides with full Moon day. Thiruvathira is also the birth star of Lord Shiva and also the day when He came out his deep meditation after Sati’s self-immolation and married Parvati. Women observe a day long fast and perform various rituals. Tamilians celebrate this day as Ardra Darshanam and worship Shiva and go to the temple before sunrise. There is also a version that Thiruvathira festival is celebrated in memory of the revival of Kamadeva, the mythological God of love, after he disrupted Shiva’s meditation that resulted in him burning to death due to Shiva’s fury. My mother still fondly recalls the joyful Thiruvathira days during her teenage days. They used to wake up early (4 am) and women from other homes would come and they proceed as a group, gathering other women along the way and singing songs praising Lord Shiva as they walk towards the temple pond of a Shiva temple. They would carry clothes, new set if it was available. At the pond, they would place their clothes on the roots of the huge banyan tree. Getting into the pond would be a difficult task as Dhanu masa mornings are misty and cold although Kerala hardly experiences any winter. Some bold ones who have already got in would splash water on the hesitant ones still staying by the steps of the pond. While taking bath, they sing songs and rhythmically splash water using their fists (thudichu kuli). Towards the end, while still standing inside the water, they hold hands and stand in a circle. After bath, they wear their new set of clothes, visit the Shiva temple, and then eat a banana and chew betel leaves. My mother says they were too poor to even afford to buy bananas and she used to look forward to the banana that was given by one of the women who belonged to a rich family. They sing songs and return home where a swing hung on a tree in front of the house awaits them. They take turns to sit on the swing, sing songs, and swing each other. Thiruvathira fasting is observed by women by abstaining from all rice-based items and only eating preparations of wheat, millets, fruits, and a mixed vegetable dish called Thiruvathira puzhukku cooked mainly out of tubers. The main ingredients of this dish are purple yam (kaachil/kaavithu), colocasia (chembu), Chinese potato (koorka), yam (chena), raw plantain (ethakaya), broad beans (avarakkai), mung beans / long beans cooked with a thick paste of freshly ground coconut and jeera. A sweet dish made of arrowroot powder (koova) and jaggery is also a speciality of this festival. In some parts of Kerala, on this day, women chew 108 betel leaves and redden their lips. Women observing Thiruvathira fast keep vigil at night by engaging in song and dance rituals on this full moon night. An image of Siva is placed at the central courtyard and flowers, banana, and jaggery are offered to the deity. Women then perform Thiruvathirakkali round the deity. They stand in a circle around a lighted lamp and sing and dance clapping their hands. The theme of the songs revolves around Parvati’s love and longing for Shiva’s affection. Thiruvathira dance is the epitome of feminine grace, charm, and subtle lasya. There is also a custom called Pathira poochoodal (wearing flowers at midnight). The first Thiruvathira of a new bride is called Poothiruvathira or Puthen Thiruvathira is very special. A special preparation cooked using tubers during the Thiruvathira festival. The main ingredient of this is a special purple yam, which is harvested during winter. Soak the green gram dal overnight and pressure cook it. Keep aside. Cut the vegetables into cubes and put them in a cooking pot. Add some water (just enough to immerse half of the cut vegetables). Add turmeric powder and chilly powder. Close with a lid and stir occasionally. Grind the grated coconut and cumin seeds to make a coarse paste. If you are using green chilies, add that along with the coconut and cumin seeds. When then vegetables are tender and well cooked, add the cooked green gram, ground coconut paste, and salt. Mix well and cook for 2 minutes. Turn off the fire and add the coconut oil and fresh curry leaves. The dish gives out a pleasing aroma. This dish is a self-sufficient meal in itself. There are many variations to this dish. You can also try adding your own combinations of vegetables. A sweet dish that is made from arrowroot powder, which is usually made from home-grown arrowroot plant. Its a lengthy and tedious process of pulling out the root, cleaning, chopping, grinding, adding water, and distilling the powder. At the end of all this you end up with very little quantity of arrowroot powder. Melt the jaggery in water. Strain to remove the impurities. Mix the arrowroot powder in some water and make a smooth and thin paste without any lumps. Add this paste to the jaggery syrup. Place this mixture on the stove. Stir continuously on low flame. The mixture starts thickening. Turn off the fire when the mixture becomes a fine paste. Add cardamom powder and grated coconut. Mix well. You can add ghee or cashew fried in ghee but this is optional. You can also add cooked moong dal along with the arrowroot powder. There could be regional variations to both these recipes. During Thiruvathira, Palakkad brahmins prepare a dish called Kali, a sort of rice halwa. A healthy concoction of vegetables in mildly flavored coconut gravy, a stew of sorts, a must-have for feasts. You can add tamarind pulp instead of curd. You can use any vegetable for avial. Avial itself means an assortment/mixture of various things. Yet, the traditional avial uses only native Kerala vegetables and does not use vegetables like potato, capsicum etc. So try to use ‘traditional vegetables’ to get the conventional taste. Traditionally used vegetables for avial are ash gourd, malabar cucumber, drum sticks, elephant yam, carrot, raw banana, pumpkin, long beans, snake gourd, bottle gourd. Wash, peel, and then cut the vegetables of same length of 1 to 1-½ inch pieces. In a wok add ½ cup of water and add the cut vegetables. Ensure that the water is just enough for the vegetables to get cooked, not too much and not less. Add a pinch of turmeric powder. Close with a lid and cook in medium flame until all the vegetables are cooked. Stir occasionally. Add salt. While the vegetables are cooking, in a mixer, grind the grated coconut, green chilies, cumin seeds, and shallots. Grind coarsely. Add the ground paste to the cooked vegetables and let it simmer for 2 minutes. Add curry leaves. Turn off the fire. Beat the curd and add it to the cooked vegetables. Mix well and add 1 tbsp coconut oil mix. Avial is ready to be served. Avial can be eaten along with rice and sambar. It is a wholesome dish and can be eaten as a salad also. Here is an interesting story about the origin of avial. Bheema, the strongest of the of Pandava brothers, worked as a cook in the Virata kingdom during the one year that Pandavas spent in disguise. The king of Virata did not like wasting a thing. Once, during one of his trips to the royal kitchen, the king noticed that there were small bits and pieces of various vegetables lying around even after all the cooking was complete. The king ordered that these vegetables should not be wasted and should be put to better use. Bheema then cooked all the leftover vegetables together and added some leftover coconut, curd and the rest is history! The inevitable item of every good sadya was thus born in the royal kitchen. It is a much loved dish and is commonly found in restaurants. But seldom will you find the original taste of avial there. Try an authentic sadya avial and then you will know.